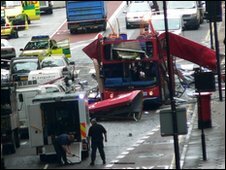 Police have only just discovered they held the fingerprints of the ringleader of the 7 July suicide bombings in London on file before the attacks. West Yorkshire Police said it "recently" found two sets of Mohammad Sidique Khan's prints in its archives, one of which dates from when he was 11. The second set of prints was taken in 1993, when he was arrested for assault. The revelation was made at a hearing to decide the format of inquests into the deaths of those killed in 2005. The fingerprint records came to light after Scotland Yard contacted West Yorkshire Police last month to check whether they had the bomber's prints on file. Khan, 30, from Dewsbury, near Leeds, and three other suicide bombers detonated their devices on three Tube trains and one bus leaving 52 people dead along with their killers. West Yorkshire Police said in a statement: "In preparation for the inquests into the events of 7 July, West Yorkshire Police recently found two sets of fingerprints in its archives belonging to Mohammad Sidique Khan, of which it was previously unaware. "West Yorkshire Police are making inquiries into these records and continuing preparations for the forthcoming inquests." The coroner, Lady Justice Hallett, has been hearing legal argument this week at the Royla Courts of Justice about what form the inquests - expected to start in October - should take. Lawyers for many of the bereaved families say the inquests should include a broad-ranging investigation of whether the authorities could have prevented the bombings. But MI5 argues this is both unnecessary and impossible because such an inquiry would harm national security. Another key issue the coroner must decide is whether the inquests for the four suicide bombers should be combined with those for the 52 innocent victims. Relatives of those killed oppose the hearings being held together because of the distress this would cause them.